Whenever I go shopping, I will come across at least one woman who will be wearing heavy makeup and a dark lipstick. Instead of thinking how beautiful she was, the only image that I can conjure up is a clown or a drag queen. No disrespect to the all the women who wear makeup, heavy or otherwise. Underneath all the thick foundation are women with natural beauty. Don't bury your beauty under all the foundation and bright blusher. The keywords are to play down the weaker features and play up the best feature on your face. Here are 16 tips on how to apply lipstick so that your lips will be accentuated. 1. Don't emphasize on the eyes and the mouth. If you like to wear red lipstick, keep the rest of your makeup light. On the other hand, if you are playing up the eyes, then keep your mouth light with a gloss or light lip color that is subtle. 2. To plump up lips, apply liner just outside of your natural lip line. All you need is just a dab of gloss in the middle of your lower lip. 3. Rule to apply lipstick? There is no hard and fast rule how to apply lipstick. Personally, I use a lip brush or sometimes just apply straight from the tube. If I feel like it, I will use a lip liner before applying the lipstick. Some women would take to using their middle finger to dab on the color. Whichever way you choose, as long as the color gets onto your lips, it is all that matters. Fill in your lips with the liner as a base so that your lipstick or lip gloss will last longer. 5. Do you line before or after? Again, the choice is yours. Line it before or after as long as your lips look natural with a defined lip shape. 6. Don't use a dark line with light lipstick. Make sure that the liner matches the lipstick or gloss color. Otherwise, a dark liner and light lips is tacky. 7. Never test lipstick on your lips. Unless you wipe of the lipstick with a tissue, it's just not hygienic. It would be better to test the lipstick on your fingertips because it has the closest tone to your lips rather than to test it on the back of your hand. 8. Make new lipstick colors. How? It's easy. 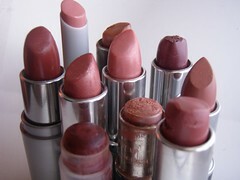 Take the lipstick colors that you don't like or doesn't suit you and blend them together to create a great lip color! To tone down a bright lipstick, color your lips with a darker liner before apply the bright color. 9. How to keep lipstick off glass. Before you take a sip from the glass, discreetly lick your lips. 10. How to keep lipstick off your teeth. Try this neat trick. Just after applying lipstick, stick your clean index finger into your mouth, then pull it out. Any excess will come off on your finger rather than on your teeth. 11. Use lipstick as a blusher. However, never use blush as a lipstick. 12. The older you get, the creamier your lips should be. The simple reason is that our lips will thin out. When that happens, you should choose a creamy lipstick and avoid matte, frosted or dark lipsticks. Gloss is fine. In fact, gloss can plump up the lips a little. 13. One color fits all? There is no one color lipstick that is suitable for everyone. Your skin tone will determing what shades are right for you. You love a lip color your friend is wearing, but when you apply it, you face may look pale while your friend's look is fresh. Very few people can pull of orange or brown shades. This includes corals. These particular shades tend to make teeth look yellow. 14. How to camouflage yellow teeth. Wear lipstick with a bluish undertone will help to downplay yellow teeth. Look for shade including plums, pinks, violets or wines. 15. Broken Lipstick? A simple solution. Especially if the color was one of your favorites. Just take off the broken portion with a tissue, slowly wave a lit match under the broken piece. When it has melted a little, gently push it back on the base, swivel it down and keep it in the fridge without the cover for at least half an hour. 16. You have come to the end of the lipstick. Once the lipstick has become flat, don't immediately throw it away. To get extra mileage, use a cue tip to scrap out the remaining lipstick in the tube. Then mix it together with vaseline or lip gloss in a lipstick palette. Apply with a lip brush. (the kind that has days of the week individually capped). Heat it up in a microwave until the lipsticks melt. And you have just created seven new lipsticks! My next topic for discussion is, "What you should know before visiting a Cosmetic Counter". Floral Design using a pen. Thank you for looking and taking the time to read my blog. I welcome feedback and please feel free to share your experience in relation to this topic. I enjoyed this article, especially d last extra tip at d end of d article. That's very kind of you. I am glad you like this article. I too, find the tips useful especially when I have tubes and tubes of lipstick color that I don't like lying around in my drawer. Now at least I can mix the colors to make a new shade.